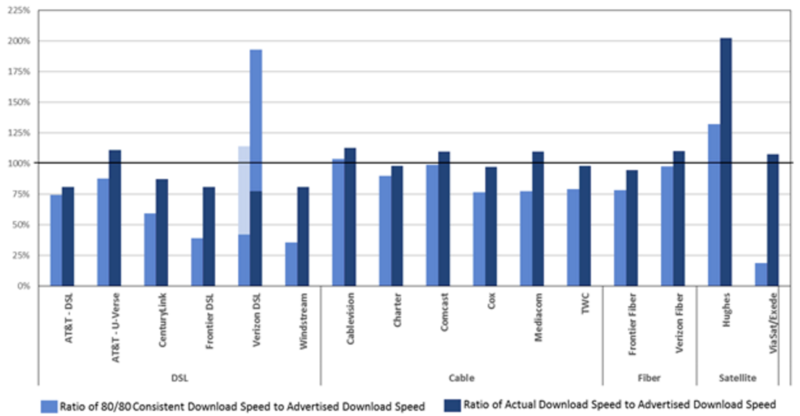 Broadband Speeds stories at Techdirt. stories filed under: "broadband speeds"
The attempt to bury belated data in a study appendix nobody will read is just another example of Pai's largely blind fealty to the industry he's supposed to be holding accountable. From the attacks on net neutrality and FCC oversight to his efforts to literally weaken the very definition of competition, Pai continues to be the very best friend any lumbering telecom monopoly could ask for. After all, if you can manipulate or obscure data showing just how broken the US broadband industry is, it's far easier to justify your complete and total apathy toward actually doing anything about it. Buried in the suit were all manner of interesting allegations, including claims that Charter executives discussed via e-mail how they hoped to manipulate congestion to drive up costs for companies like Netflix (you'll recall this was part of the whole interconnection slowdowns Netflix and companies like Level3 complained about a few years ago). The suit also highlights how Charter gamed the results of a program the FCC has traditionally used to measure real-world broadband speeds using custom-firmware embedded routers in consumer volunteer homes. Charter has since been trying to tap dance out of the suit by flinging pretty much every legal argument against the wall to see what sticks. Most recently, the company tried to claim that the FCC's recent net neutrality repeal contains language banning states from trying to protect consumers. And while that was certainly the hope of Ajit Pai's FCC, legal experts have argued that the agency's claims don't hold water. More specifically, when the FCC rolled back its Title II authority over ISPs, it also ironically dismantled its legal authority to tell states what to do. Amusingly, Charter has now shifted its argument to the claim that the entire lawsuiit is somehow part of an unholy cabal orchestrated by Google and Netflix. You might recall that ISPs (and Ajit Pai) have long tried to claim that the entrenched telecom monopolies are innocent daisies, and that net neutrality is simply a conspiracy concocted by Google and Netflix to ruin AT&T, Verizon, Comcast and Charter's livlihood. This narrative has been routinely driven by ISP policy folks despite the fact net neutrality is very much a bipartisan, grassroots consumer welfare issue. "Charter's unclean-hands defense is that Plaintiff actively conspired with private parties through Tim Wu (a leading critic of ISP business practices) to investigate and sue Time Warner Cable Inc.," he wrote. "Thus, Plaintiff delegated what should have been an objective law enforcement investigation to third parties whose pecuniary and political interests are adverse to TWC's, and who had preconceived notions of how and why to penalize TWC." The letter then goes on to talk about documents produced by the other side that allegedly show how Wu and third parties "manufacture[d] fraud claims" and how his "co-conspirators boasted of having orchestrated Mr. Wu's work." The names of the individuals who allegedly were in cahoots with Wu include Google's Meredith Whittaker, who in a 2015 email to a colleague, discussed having gotten off the phone with Wu about the NY AG consumer protection complaint and how it would frame interconnection as a consumer harm issue." "Charter is taking the notion of a "cabal" seriously, also pointing to communications with several individuals at the New America Foundation, a Washington, D.C.-based think tank." Ironically, both Google and Netflix's interest in standing up for consumers on this subject has waned proportionally with their growing power over the years. Still, Netflix and Google had every right to be concerned about what Charter and other ISPs were up to, since they were effectively trying to use their last-mile broadband monopoly to unfairly jack up costs for consumers, content creators, and transit operators alike. That Wu corresponded with companies with legitimate anti-competitive concerns over what broadband monopolies are up to isn't likely to scuttle the case and has the faint whiff of desperation. Charter's other legal efforts to derail the case haven't gone well so far, and it's unclear whether this latest gambit will work. But it's abundantly clear that Charter is particularly worried about the ramifications of this case, given they appear to have been caught on e-mail routinely lying to the public and regulators. As we've been noting, uncompetitive monopolies like Charter are working together to demolish FTC, FCC, and state authority over their businesses, and they're using every trick in the book to do so. Just about a year ago, the FCC voted to raise the base definition of broadband from 4 Mbps downstream, 1 Mbps upstream -- to 25 Mbps downstream, 3 Mbps upstream. This, of course, annoyed the nation's mega providers, since the higher standard highlights the lack of competition and next-generation upgrades in countless markets. It especially annoyed the nation's phone companies, given that the expensive, sub-6 Mbps DSL foisted upon millions of customers can no longer even technically be called broadband. Focusing on the fact that a single Netflix stream eats just 3.5 to 5 Mbps ignores the fact that broadband connections serve an entire house of hungry users, many of whom will be gobbling significantly more bandwidth using any number of services and connected devices. It's also worth pointing out that a single Netflix Ultra HD stream can eat 25 Mbps all by itself. And on the upstream side of the equation, the FCC's definition of 3 Mbps remains relatively last-generation and arguably pathetic. Similarly, many consumers may not buy 25 Mbps because the lack of competition can result in high prices for faster tiers. In other words, claiming 25 Mbps is some kind of "arbitrary," pie-in-the-sky standard is absurd. Of course, the Senators don't really care about technical specifics, they're just blindly echoing the broadband industry's annoyance that the FCC is now actually highlighting the lack of broadband competition in the market. They're specifically bothered by this recent FCC study, which notes that two-thirds of U.S. households lack the choice of more than one ISP at speeds of 25 Mbps or greater. Companies like AT&T and Verizon also don't like how this data highlights the fact they're giving up on rural America and many second- and third-tier cities, freezing broadband deployments and in some cases even refusing to repair aging infrastructure. And while it's certainly true the higher standard helps prop up the FCC's Congressional mandate to ensure quality broadband is deployed in a "reasonable and timely" basis (and by proxy its Title II reclassification), a lot of the FCC's efforts have quietly involved eliminating regulation, ranging from streamlining tower placement and pole attachment regulations, to eliminating the kind of awful state level protectionist laws that keep municipal and public/private broadband networks from taking root in incumbent duopolist territories. At the end of the day, incumbent providers and the politicians who love them are simply annoyed that the FCC has any standards whatsoever, since that makes it immeasurably harder to pretend that the nation's broadband competition and connectivity issues don't exist. The more statistics are gathered on broadband speed, the more evidence accumulates that the United States' lack of true broadband competition is holding this country back. Karl Bode at DSLreports points to the latest data gathered by Ookla, which shows the US is still lagging behind several countries in connection speed. According to the latest Speedtest.net data from Ookla, the United States has fallen to 31 in mean downstream broadband speed, behind such countries as Uruguay, Estonia, and Latvia. Ookla notes they collect the data from millions of user connections, measuring the "rolling mean throughput in Mbps over the past 30 days where the mean distance between the client and the server is less than 300 miles." As Bode points out, part of this is due to the geographic sprawl of the United States. Many of the countries listed above the US (Malta, Macau, Luxembourg) are exponentially smaller than the US. But that's not the entire story. Countries with comparable sizes rank near the US in speed. One is Russia (#35), whose infrastructure is still hit-and-miss (but still a bit of an overachiever). The other is Canada (#37), a country with its own competitive issues. Even weighing those factors, the lack of competition is still the main contributor to these under-performing speeds. As Bode notes, the speed results are also low because many customers don't purchase the fastest tier available. Again, this is because faster tiers are prohibitively expensive for most users. If other countries are obtaining better speed results, their customers are being offered faster speeds at affordable prices. Not only are Americans connecting at subpar speeds, but they're not even getting what they've paid for. Ookla's "Promise Index" compares actual speeds with advertised speeds. According to its numbers, the US ranks 28th in the world. The actual percentage isn't terrible (92.95%) but it is another sign that there's a reason every advertised broadband package contains those two special words, "up to." There doesn't seem to be much improvement on the horizon, either. Time Warner Cable is for sale and it's made it clear its preferred buyer is none other than Comcast, a cable company that routinely finishes towards the "top" of Consumerist's "Worst Company in America" polls. This would effectively give Comcast one-third of the national broadband market. This purchase would need approval from regulators (the DoJ and the FCC), but these agencies have been talked into very questionable "consolidations" in the past. 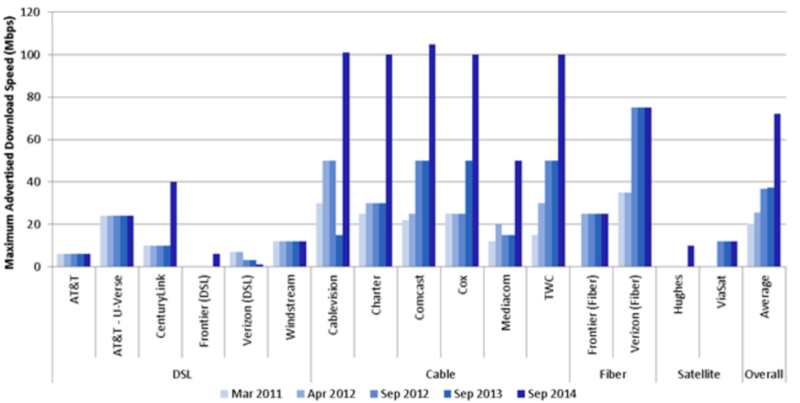 If the broadband market's ever going to improve, it needs more players. The incumbents have spent several years building up roadblocks to discourage new competitors. Google's fiber efforts may be spurring very belated improvements in limited markets, but it's hardly the answer. Without some sort of large-scale disruption, we're likely looking at rising costs, stagnant speeds and a push by providers to preferred high-margin services and the steady creep of customer-unfriendly usage caps. With the threat of Google's fiber expansion making real competition a reality in some markets (rather than the perceived competition where multiple cablecos and ISPs offer middling service while offering small discounts or limited time price breaks), AT&T is now being forced to upgrade its existing service in the affected area, or at least, to pay it some lip service. Its press release following the news read more like a Bart Simpson quote: "We can't promise to try. But we'll try to try." It appears AT&T is actually doing at least a little something for its existing fiber customers in Austin. Austin members of the DSLReports boards are reporting that AT&T has removed the governor (or loosened it, anyway) on its fiber connections, bumping the speed up to nearly 2.5% of Google's offering. I called to cancel U-Verse because Time Warner offers Docsis 3.0 speeds for far cheaper in the Austin area. Uverse told me that select FTTH customers can now get 24/3 instead of the previous cap of 18/1.5. They just have to send a "special" technican to upgrade my equipment. I am letting them come and try because I don't believe it. Why aren't these fiber customers already enjoying vastly improved speeds over other U-Verse subscribers? Why has it taken the threat of a real competitor to remove the artificial cap AT&T installed? Apparently, it's because AT&T wants to treat all of its customers fairly and ensure they receive the same lousy connection speed. While AT&T took the cheaper route when upgrading portions of their network to fiber to the node, the company has historically offered fiber to the home to a few locations (less than a few hundred thousand), primarily in upscale housing developments. While those lines are capable of significantly higher speeds, AT&T has traditionally capped those users at the same speed as other U-Verse users. The company told me in 2007 this was to create a "more consistent experience." That means you have users on cutting-edge fiber infrastructure, in some places seeing downstream speeds of just 6 Mbps -- and upstream speeds of just 1.5 Mbps. Given these past speed issues, this is why most AT&T customers will believe 1 Gbps only when it's up and running. Exactly. Time Warner Cable, facing direct competition from Google Fiber, flat out stated there was no demand for this connection speed and that it would certainly be happy to provide 1Gbps connection should anyone prove they actually needed it. Translation: probably never. AT&T's slippery press release "nailed down" pretty much the same approximate timeframe. It's clear competition will have some positive effect for those in the covered areas. I'm sure TWC and AT&T are both happy a nationwide Google expansion would be prohibitively expensive, allowing them to continue providing subpar connection speeds and terrible customer service.